There is a first for everything right? This is most definitely my first football book ever, but I also think it’s my first biography in some sense..I think so, I can’t remember all the books I’ve read I’m afraid, hehe. I stumbled upon this book on Kindle because you could read parts of the first chapter for free. I liked the writing style and I’m personally an Arsenal supporter, so I thought; why not give it a go? Mesut Özil has Turkish roots, but grew up in Germany and plays for the German national team. On a daily basis, he plays for Arsenal Football Club, a club with its home turf in Northern London. Growing up in a family where money was tight Özil learned early in life what it meant to put in hard work for something you desire. As a young boy, his most precious possessions were a bike and a football. His football skills were to become his greatest pleasure and also what gave him opportunities in the world. He has played for clubs like Rot-Weiss Essen, Schalke 04, Real Madrid and now Arsenal. This is the story of his life. I’m not the biggest football fan, but I’d rather watch football than any other sport. Maybe not handball, football has to move aside for handball in my opinion, but if you ask my boyfriend I’m pretty sure he’ll tell you that you can do both. He and his father were the ones who got me into watching football more actively. They’ve been Arsenal supporters for a long time. With them, add in my older brother, my two nephews and my best buddy are also Arsenal fans so I’m kinda surrounded, which is nice, for when I watch a game I can’t always tell what is happening or why the referee blows his whistle so it is nice to have someone to ask. I do understand goals, corners, free kicks and offside, but that’s about it. My younger brother is a Chelsea fan so I suppose he didn’t quite get the memo, haha. My limited knowledge of football isn’t a great disadvantage when reading this book, I would actually say that it’s an advantage at times. Özil explains things so easy that even a relatively inexperienced person can follow. I do sometimes fall off when technical terms are presented when Özil recalls a match, but you do understand that something is happening, and the tone he recalls things it will give you a hint of whether it is something good or bad. I felt like I got a better understanding of football while reading this book, which is nice because I do enjoy a good football game. While reading this book I also felt that I got a better understanding of Arsenal as a club, and maybe this will help me understand the game they play a little bit better next time I watch a match. That would be on Thursday if I’m not mistaken. What I really do enjoy is how Özil uses language in the book. He is native in Turkish, but he speaks German, Spanish and English. In the book, there are some extremely British sayings that made me laugh out loud. Not because they were misused, but simply because I love the fact that he does use them. There is one scene in the book during El Clásico (a match between Real Madrid and Barcelona) where things get heated, Özil gets a slap on the head and I believe the term he uses is ‘That really takes the biscuit!’. I thought it was the perfect expression for the situation, and it made a lot of sense while it also sounded a little bit out of place, but not in a bad way. There are other scenes in the book where these occur, and I really enjoyed them all. After reading this book I’m left with the feeling of having had a little peek inside the great world of football. I think people often forget that footballers and other celebrities are people as well. They have something that makes them special and interesting to people, but this also leaves them with less privacy than a normal person. That and moving a lot, at least in this sense, when changing clubs. The book is honest and open which gives me an opportunity to see the man behind the football player as he wants me, as a reader, to see him. 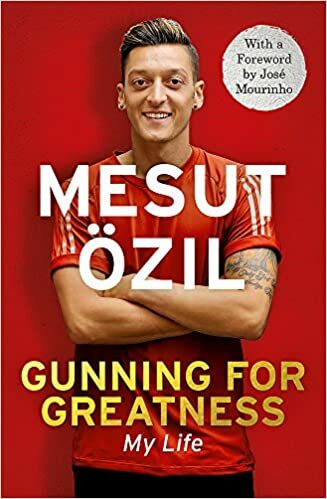 Due to my limited football knowledge, I haven’t paid attention to a lot of the football gossip, so I was kind of surprised by some of the scenes in the book which Özil describes. If I say more there will be too many spoiler alerts. Another important aspect of the book is integration. As a player with Turkish roots, who grew up in Germany, Özil early on has to make an important career choice considering which national team to play for. This makes his journey a little bumpy, but it also makes for a great story about how integration, when done right, can turn out amazingly. All in all, it is a great book and I would really recommend to read it, football fan or not!